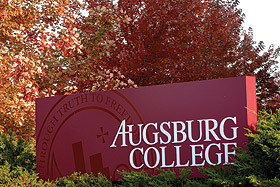 Through the dedication of our generous donors and the good work of many members of the Augsburg community over the past year, the College is beginning a new phase in the development of the Centers of Commitment that have been established to lift up Augsburg's core values and live out our institutional vocation. It is with gratitude and great anticipation that we announce the creation of the Clair and Gladys Strommen Center for Meaningful Work and the expansion of the Martin Olav Sabo Center for Citizenship and Learning. The Strommen Center is the newest of the four Centers of Commitment that include the Augsburg Center for Faith and Learning, Center for Global Education, and Sabo Center. Augsburg is grateful to the Strommen family for establishing the Clair and Gladys Strommen Center for Meaningful Work that will recognize Mr. and Mrs. Strommen's personal commitment to creating meaning and purpose in work and life. The career services/internship programs currently provided through the Center for Service, Work, and Learning will be moved to the Clair and Gladys Strommen Center for Meaningful Work. This change will provide greater visibility for these programs and enhanced services to undergraduate and graduate students. 1) The Clair and Gladys Strommen Internship and Career Center directed by Lois Olson. Heidi Lender, Sandy Tilton, and Erin Koolen will join Lois in this work. This Center will engage students in connecting academic learning with the exploration of vocation and career development. 2) The Clair and Gladys Strommen Faculty Fellow will build curricular offerings in the marketing area, and will collaborate with the Internship and Career Center and other College Centers to maximize synergies, effectiveness, and public outreach. David Schwain, assistant professor of business administration/marketing has accepted an appointment from the Dean of the College to serve in this role. The service-learning and community engagement programs provided through the Center for Service, Work, and Learning will be moved to the Sabo Center for Citizenship and Learning under the direction of Mary Laurel True. Kristin Farrell and Brian Noy will report to Mary in their respective roles with the Bonner Leaders Program and the Campus Kitchen program and community garden. The College's deep and abiding commitments to civic engagement and the theological exploration of vocation have brought international recognition to Augsburg College. Students, staff, faculty, and alumni demonstrate each day how central both commitments are to the College's identity. These changes are effective November 1. We will be working over the next several months to integrate The Clair and Gladys Strommen Center for Meaningful Work and the expanded Martin Olav Sabo Center for Citizenship and Learning more fully within the Augsburg College community. Augsburg thanks Martin and Sylvia Sabo and the Strommen family for their important contributions to the College through the creation of these Centers. The lives of students, faculty, and staff will be enriched through their great generosity.